Facial and fingerprint recognition technologies are expected to see accelerated growth over the next five years as security applications emerge in the government, enterprise, finance, consumer and other markets. The market value of facial recognition technologies is expected to nearly double from $230 million in 2015 to $450 million in 2019; that represents a compound annual growth rate (CAGR) of about 18%, according to market research firm TrendForce. Led by Apple's iPhone juggernaut, unit shipments of fingerprint sensors have grown from 316 million in 2014 to 499 million last year and will continue to increase each year to peak at 1.6 billion in 2020. Revenue growth for fingerprint sensors will increase from about $1.86 billion in 2015 to $2.6 billion in in 2020, according to the latest research from IHS Technology. Additionally, Iris recognition on smartphones is also seeing an uptick in adoption, though it still represents a tiny sliver of the market. Iris recognition is an automated biometric identification technique that uses mathematical pattern-recognition via video images of one or both of a user's irises. "Iris has now been adopted recently into a few smart phones - such as the Fujitsu Arrows NX F-04G and Lumia 950 (which both use Iris to unlock the device, making a fingerprint sensor unnecessary)," Jamie Fox, an IHS principal analyst, wrote in an email reply to questions. 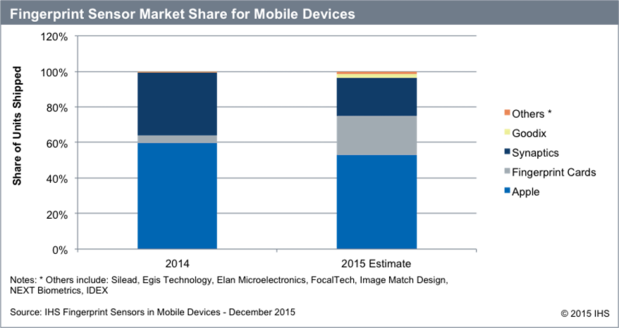 Iris devices had about 1% or less of the market in 2015, Fox said. There is speculation, however, that LG and Samsung are planning to use Iris in 2016, so the market may expand. But fingerprint readers currently dominate in smartphones, Fox wrote. According to Fox, the market for facial recognition is also less developed than that of fingerprint scanning technology. Even so, TrendForce analyst Christy Lin said that, compared to fingerprints, human faces have biometric features that cannot be easily duplicated. "Moreover, facial recognition is also likely to be more widely accepted by consumers and has a wider scope of applications," she wrote in a market analysis. While facial recognition technology is primarily used in security and monitoring systems, its use is gradually expanding to other areas such as smart retail and mobile payment. Last year, Alipay, the online payment platform launched by Alibaba, jointly launched a payment verification system with Face ++, which is a cloud-based facial recognition platform operated by a Chinese startup known as Megvii. Aptly named "Smile to Pay," the payment verification system lets Alipay users pay for their online shopping by taking selfies. 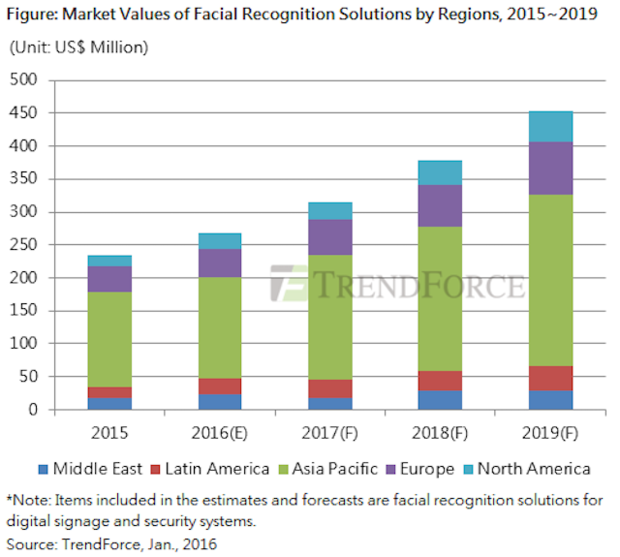 "Other major technology companies that have been investing in facial recognition in recent years and hold related technology patents include Microsoft, Google, Apple and Facebook," TrendForce's Lin wrote. Lin also noted that current mainstream facial recognition systems, which record and match 2D images of individuals' facial features (i.e. eyes, nose, mouth and ears), can still be deceived by regular photos and videos. With that in mind, developers are now advancing toward 3D facial recognition. One major type of 3D facial recognition technology verifies both the image that a face produces under visible light and the depth of facial features with the help of infrared (IR) light. Another common 3D facial recognition technology uses IR light dots to measure and verify the distances and depths of facial features, Lin said. A prominent example of 3D facial recognition technology is the RealSense Camera, a 3D scanning product jointly developed by Intel and Microsoft. RealSense Camera is designed to work with Microsoft's biometric authentication software called Windows Hello and uses IR laser to capture facial features for record keeping and verification. Since more efficient processors will be needed to manage 3D models stored in the databases of facial recognition systems, Lin said Intel stands to benefit greatly from developing and promoting products for this application. "Biometric identification technology ... constitutes an opportunity for Intel to turn things around as the chip maker is being hard pressed by competition from ARM and Qualcomm," Lin said.